Do you ever think that words and numbers sometimes just don’t inspire? Your revenue or service goal is important, but your team or associates don’t seem to “see” it. 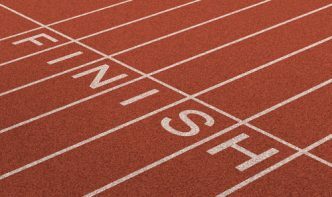 Several client companies and owners turned their goals into visible finish lines. Literally seeing the goal made a huge difference in the conversation within the company and in the energy needed to cross the line. ◊ The home remodeling company owner was obsessed with their online ratings. He wanted to see the bar that represents 5-star online reviews extend way far to the right and the lower bars be tiny in comparison. We mocked up what that would look like and posted it around the company. The owner’s email signature included the visual finish line—the long 5-star bar. People began talking about how what they did was going to contribute to the 5-star bar. 90 days after the launch of the 5-star campaign, their online reviews were coming in heavily at 5 stars. The 5-star bar became a reality. ◊ One CPA showed me the firm’s third quarter P&L. As is typical in financial statements, the bottom line loss was the dollar amount bracketed by parentheses (5000). He wanted to plan ahead to increase revenue the following summer. We reprinted the P&L with the loss in large red numbers. We tested many ideas for revenue that would “turn the red to black.” Eventually we rolled out a transformational plan. Part of the communications within the firm for the roll-out was an abbreviated P&L with the red number this year and the black bottom line the next year. This visual of the red and the black made a real impression on people who deal with numbers all the time. At the end of the following summer, that bottom line was definitely black. Everyone could see the results of their work. ◊ The architect’s pipeline was unique to him, for sure. He had a bulletin board and pinned index cards to it when he got an inquiry about the kind of luxury additions they do. He’d make notes on the cards to track the progress of a prospect. Some fell out immediately. He moved the others along, from in-person meeting, to first draft ideas, to final plans and then complete. He told me he wanted more cards in the inquiries column. Given his typical conversion rate, he wanted 5 more inquiries per year, assuming he’d convert 1 or 2. Following our work together, he was proud to show me two changes to his pipeline: he had added a second bulletin board to accommodate his new work, and the number of card pinned under “Inquiries” was greater by 5. I hope you’ll be inspired to create your company’s visible finish line. If you need a push or some support, I would love to hear from you. Sometimes a focused 90-120 minute Select Solution Session will get the ball rolling and everyone will run with it. Call me at 703-790-1424 or email.